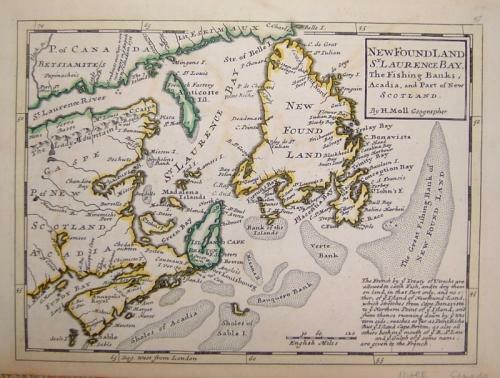 Title: 'New Found Land, St. Laurence Bay, the fishing banks, Acadia, and part of New Scotland.' from the first edition of 'Atlas minor: or a new and curious set of sixty-two maps, in which are shewn all the empires, kingdoms, countries, states, in all the known parts of the earth; with their bounds, divisions, chief cities & towns, the whole composed & laid down agreable to modern history'. A charming map in Molls unique style. In very good condition with minor offset in the image area and toning at the papers edge.